The loud roar of passing thunderstorms and other loud noises can spark fear in many animals, causing extreme anxiety not only for pets, but also their owners who must manage this stress. In order to help animals cope with these phobias, pet owners can look for different solutions with the help of their veterinarians. According to Doctor of Veterinary Medicine Lauren Connolly, there are several techniques to calm an animal during a thunderstorm. 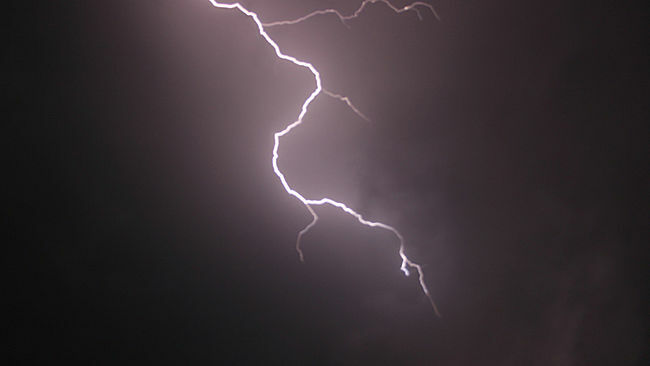 “Being afraid of thunderstorms is just a form of noise phobia,” she said, adding that symptoms from dogs are often more noticeable than those exhibited by cats. Connolly said that techniques such as calming the animal by petting them or simply sitting with them may reduce anxiety. Also, allowing a pet to have a “safe” quiet place where they can go and be undisturbed can be used. Try to block out the lightning and play loud music to block out the noise if possible, she said, adding that a white noise may help. Playing a game or distracting the animal with a favorite toy can also put them at ease, she said. In some cases, a veterinarian may prescribe anti-anxiety medications such as Alprazolam that can be administered before a storm. Other methods of reducing anxiety during storms may include conditioning a pet to not fear the sound. A concerned dog parent should work with their veterinarian to develop a safe and effective conditioning program, according to Connolly. “By rewarding this behavior you can inadvertently encourage it,” she said. Out of necessity, ThunderWorks.com CEO and Founder Phil Blizzard said his business was started after trying various methods of calming his own dog during thunderstorms. In the middle of the night during a storm, Blizzard said his dog would often awaken him by climbing on top of him while he was in bed. When methods recommended by the veterinarian didn’t work, Blizzard and his wife started looking for another solution to alleviate her fear, which motivated the creation of the ThunderShirt. “Someone had suggested a snug wrap, like swaddling, which applies a gentle, constant pressure,” he said, adding that this concept is to provide stress release for animals and humans alike. During Blizzard’s research, he said they found that more than 30 percent of pet owners reported similar anxiety in their animals during thunderstorms. 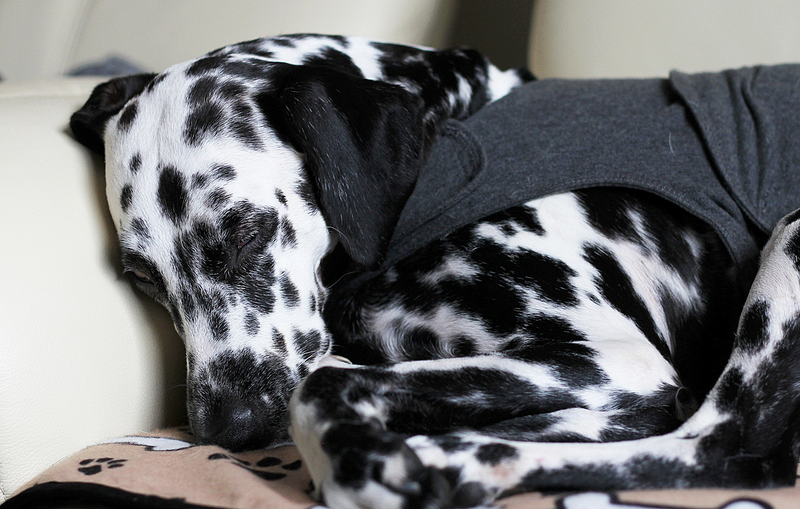 “As the name ThunderShirt implies, thunder and noises was the first fear we tackled, but along the way, we found that simple pressure helped with a multitude of pet anxieties including separation, travel, vet visits and much more,” according to the ThunderShirt website. 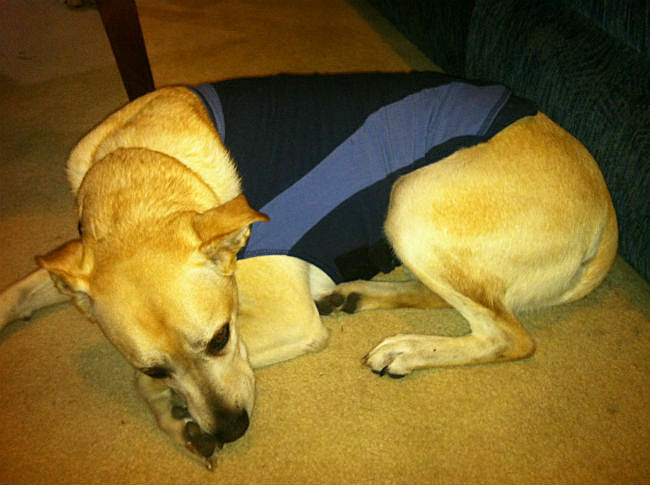 In 2008, with the help of partners and veterinary and trainer endorsements, Blizzard launched his website to sell the ThunderShirt. He now employees 25 people. Connolly said similar products that apply this method of constant, gentle pressure seem to help some animals, but are not clinically proven. Since Blizzard started his business, he has received endorsements from several thousand trainers, veterinarians, rescue groups and pet owners. “It is like a swaddle for a baby and did nothing for my dog, but I know others who have used it and loved it,” she said. Other products include a special lining to decrease animals’ sensitivity to the static charge associated with storms, she said.